According to plans leaked by New York Yimby, a skyscraper planned for midtown Manhattan would be only one foot shorter than WTC 1, making it the tallest residential tower in the world. 225 West 57th Street‘s facade will top-out 1,479′ above street level, while a surprise spire on top will cap the tower at 1,775 feet. Adrian Smith and Gordon Gill are designing the building. 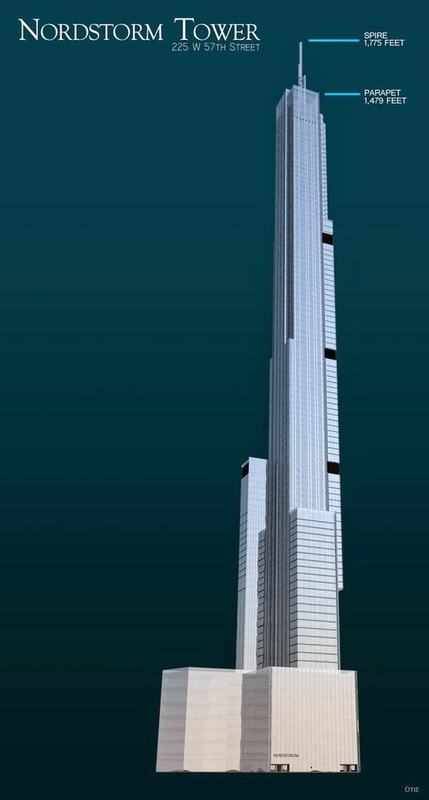 New York City’s skyscraper boom is entering unparalleled territory, and 225 West 57th Street could very well represent the crest of the current wave, assuming the tower is financed. The new height details will result in several superlatives: Manhattan will finally retake the ‘tallest roof’ in the United States from Chicago’s Willis Tower, which stands 1,451′, and 225 West 57th Street will become the tallest residential building in the entire world, surpassing both 432 Park Avenue and Mumbai’s World One Tower.